The set is Scott catalog #171-4 and is mint never hinged and F/VF. GOOD LUCK! Large Souvenir Sheets. - INTERNATIONAL SERVICE. 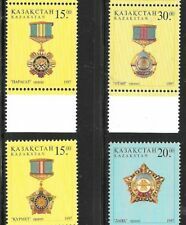 This lot contains a set of 1 MNH stamp from Kazakhstan. Kazakhstan 2018. Europa. Bridges. Small sheet. NEW!!!! Kazakhstan 2018. Small sheet. significantly lower. 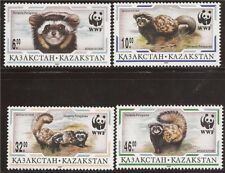 KAZAKHSTAN - 2001 FLORA & FAUNA - BIRDS & ANIMALS - MIN. SHEET MINT NH. Karaganda (February 16, 1993) to the US. Outside the United States, postage will be actual rate minus charge if it was as domestic mailing. Registration to destinations where mail service is not reliable (Italy, Russia, Ukraine, etc.) will require an additional $16.00, unless I receive an eBay message/email from you stating that I will not be held responsible by eBay/PayPal or yourself for any loss through the mail. Kazakhstan, Scott cat. 90-95, 96. Dinosaurs set & s/sheet. JKazakhstan, Scott cat. Dinosaurs issue. Kazakhstan Sc #351 Independence Souvenir Sheet + Horses set on cover to U.S.
Large Souvenir Sheets. - INTERNATIONAL SERVICE. USSR 1945. Postcard unused. Soviet writer Nikolai Ostrovsky. Very rare !!! USSR 1945. Soviet writer Nikolai Ostrovsky. Very rare ! Kazakhstan #313 Lunar New Year + 11 definitives on 2002 cover to U.S.
Kazakhstan 2018. The Paralympic Games in Pyeongchang. Block. NEW!!!! Poland 2017.Kazak block.Poles and Turks are ethnic groups of Kazakhstan. New!!! MNH in pristine condition per scan. Kazakhstan #377 Space Exploration + 7 different definitives on cover to U.S. 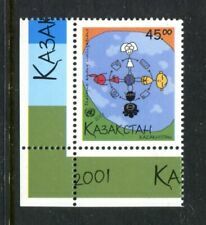 This is I believe a Kazakhstan 20 denomination stamp sheet! What a wonderful addition to the collection this will make! Kazakhstan 2016. Maximum cards. Europa CEPT. Think Green. EXPO 2017. Maxicard. Kazakhstan 2011. FDC. Europa CEPT. Forest.